This month we are highlighting the Crouch Fine Arts Library, including examples from the Jennings Collection, the Book Arts Collection, the Spencer Collection, and the Baylor School of Music Performance Recordings. Enjoy these selections, provided by Music Librarian Clayton Crenshaw. #8: Parts of the Holy Mass for a Confessor and a Bishop and Parts of the Holy Mass for a Virgin Not a Martyr. 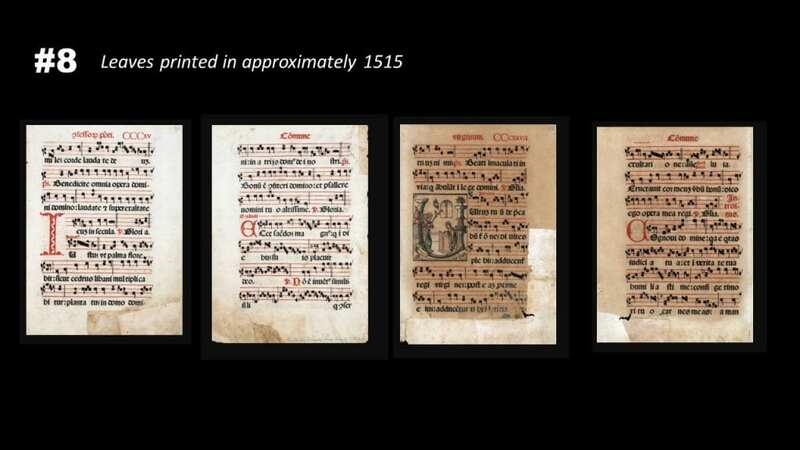 At the time this music was created, printing was a relatively new technology and music notation was still developing. The combination of those two things makes these two 500-year-old leaves very special indeed. The individual pieces of type that made the impressions were carved from wood; tiny gaps in the staff lines show the imperfections of the process. The printer is believed to be Luca Antonio Giunta of Venice, whose family established printing businesses throughout Italy and eventually in many other parts of Europe. #7 : The Tower Book designed by Beth Thielen (2007). This is one of approximately 1,000 items in the Baylor Libraries Book Arts Collection. 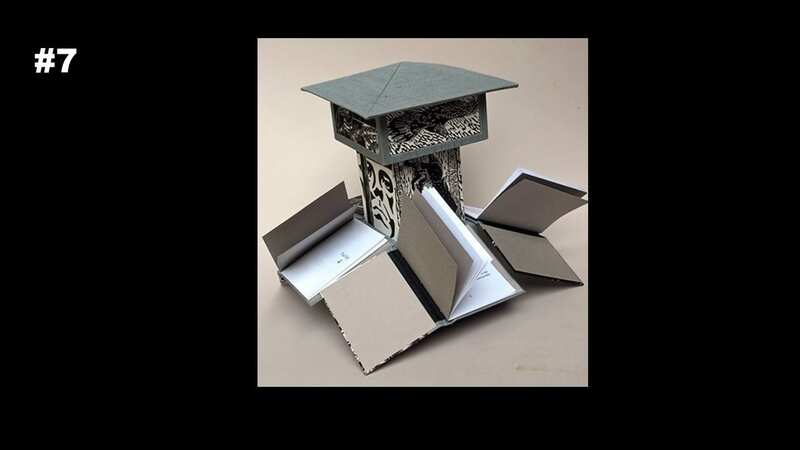 Designed by artist and educator Beth Thielen, who has worked with inmates in the justice system throughout her career, it consists of linoleum prints and four volumes of original writings by inmates at the San Quentin State Prison and the California Rehabilitation Center in Norco, California. The four books form the sides of a prison guard tower and are held together by a removable roof. 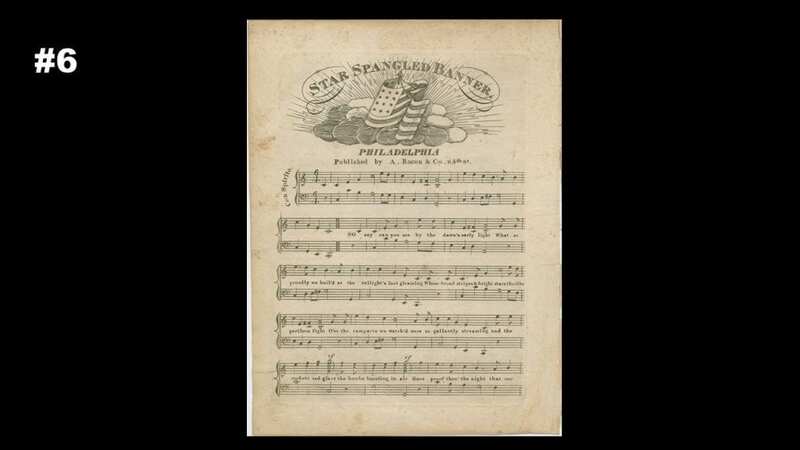 #6 : The Star- Spangled Banner by Francis Scott Key. In Baltimore in September 1814, Francis Scott Key wrote the poem that would become the text of our national anthem. Days later, it was published in the Baltimore newspapers, and shortly thereafter in other cities. It was set to a popular English tune of the day, “To Anacreon in Heaven,” as had other patriotic poems. The first sheet music edition was published (with errors) by Baltimore music store owner Thomas Carr. The second was published in Philadelphia, by A. Bacon & Co., sometime between 1814 and 1816. In the Frances G. Spencer Collection of American Popular Sheet Music, we have a facsimile of the Carr edition. But our copy of the Bacon edition is the genuine article, and available for viewing online as part of the Baylor Digital Collections website (http://digitalcollections.baylor.edu/cdm/ref/collection/fa-spnc/id/16051). Throughout its history, the Crouch Fine Arts Library has served as the repository for recordings produced by the Baylor School of Music. Most of these are archival recordings that are available to the Baylor community, but not distributed. But over the years a small number of recordings, like this one, were professionally recorded and produced to be shared widely. 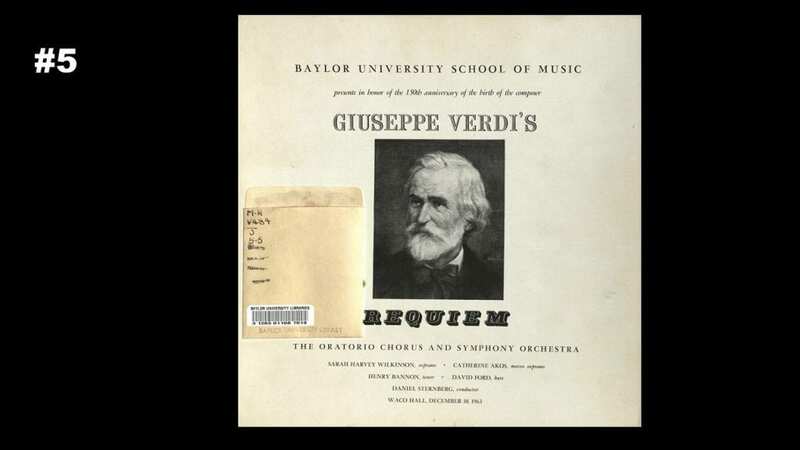 The two-record set was produced from a concert given in Waco Hall on December 10, 1963. The performance honored the 150th anniversary of Verdi’s birth, and was also dedicated to the memory of President John F. Kennedy, who had been assassinated only weeks before. Daniel Sternberg, the long-time Dean of the School of Music, conducted the Oratorio Chorus and the Baylor Symphony Orchestra. The soloists were Sarah Harvey Wilkinson and David Ford, both graduates of the School of Music; Baylor faculty member Henry Bannon; and Catherine Akos, a faculty member at Southern Methodist University. This post is part of the 50 for 50 series highlighting 50 unique and fascinating items found in the Central Libraries' special collections. The series is being held as part of the ongoing celebration of Moody Memorial Library's 50th anniversary.